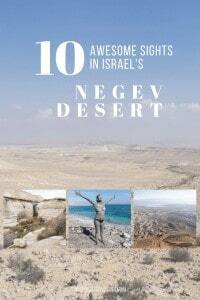 Israel’s southern half is dominated by the vast Negev Desert. Summers are hot and dry but winter days are temperate and mild. While it might get cold and rainy in Jerusalem, Tel-Aviv, and the North, the South is the perfect place for a winter get-away. I traveled here in January and February, and day-time temperatures reached 20 to 25°C. Note, that once the sun goes the temperature drops and there might even be the occasional dusting of snow during a winter night. 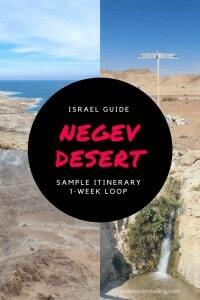 After giving you guides for different points of interest throughout the Negev and along the Dead Sea, I thought I’d tie all of this together into a sample itinerary. For your convenience, I have added links to the individual posts below each item. While the following loop can be done in as little as three days, if you opt out of day hikes, I recommend taking at least one week to ten days to enjoy the sights to see thoroughly. 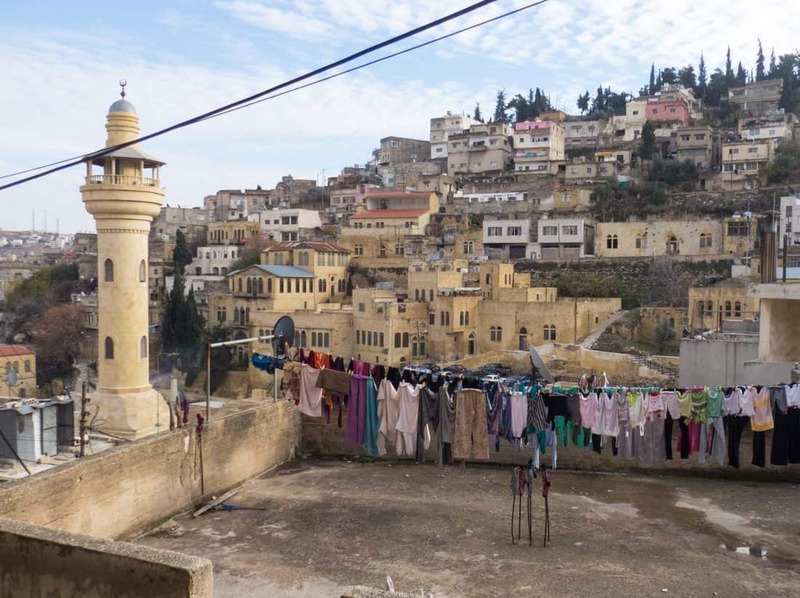 Along the route, there is accommodation for different budget levels with a little less choice along the Dead Sea. 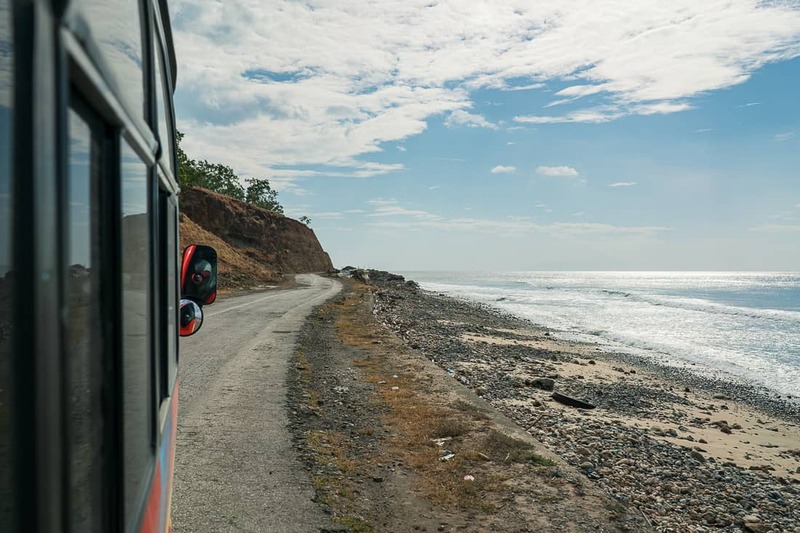 Having your own car available will allow you to move more quickly (and during Sabbath) as well as go off-road. 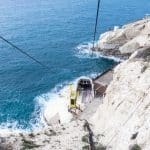 However, you can do the whole loop comfortably on public transport using Egged and Metropoline buses (make sure you check the linked posts for details on bus lines and schedules). Start your tour of the Negev in ancient, biblical Beer Sheva, where according to the bible Abraham and Isaac dug wells, and which served as a border town between the Nabataean desert and Judea. A few kilometers East of the modern city, you can visit the ruins of the old city in Tel Beer Sheva National Park. The site has been a UNESCO World Heritage since 2005 as one of three biblical cities in Israel (Hatzor and Megiddo are the other two). Follow Route 40 into the heart of the desert. You will find numerous sites left and right of the highway, some only accessible by 4×4. Most date back to the Nabataeans — of Petra fame — and they include temples, wells, castles, and cities. The biggest city is without a doubt Avdat. Conveniently, Route 40 runs right past it making the National Park also accessible by public transport. While you can do Avdat as a stand-alone excursion (exploring the ruins in detail takes about 3h), I combined a shorter visit with a hike into the desert to the oasis of Ein Akev. And instead of turning back to Avdat, I continued to Sde Boker Kibbutz, where I caught another bus. Click here to read my guide for hiking between Avdat and Sde Boker via Ein Akev. If you are visiting in the summer or can’t walk for too long, get on a 4×4 from Sde Boker. The jeep track stops about 200 m from the springs and its refreshing pools. 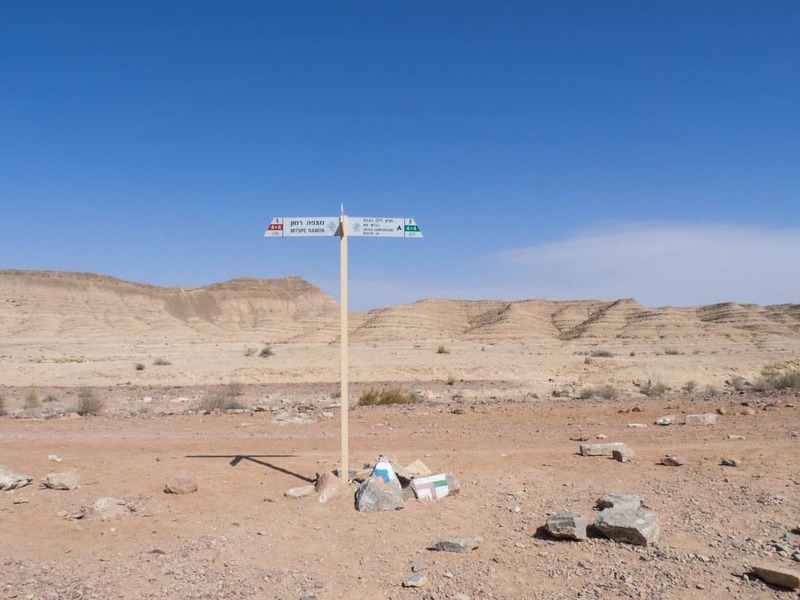 An alternative desert hike (or jeep drive) is Ein Avdat. This spring is slightly bigger than Ein Akev but also less secluded. If you are interested in the more recent history of the State of Israel, stop in Sde Boker for a bit longer. Ben Gurion, the state’s first Prime Minister, lived here in the 1950s and 60s and was buried here alongside his wife. Gurion created a vision of making the Negev bloom. Therefore, Sde Boker is also a great place to learn about modern agriculture and irrigation techniques. Midburn, the Middle Eastern edition of Burning Man, is held annually in May or June in Sde Boker. 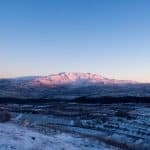 From Sde Boker and Avdat, move a few kilometers further South to another natural wonder. In Mitzpe Ramon, the land abruptly drops into the giant Ramon Crater (Makhtesh Ramon). The former workers’ village Mitzpe Ramon today draws artists and hippies and is also a center for Israel’s star-gazing fostered by clear desert skies and the Wise Observatory outside Mitzpe Ramon. To fully appreciate the size of the crater, I recommend a day hike either along the edge or, even better, into the crater. Click here for my Mitzpe Ramon and Ramon Crater guide. Going South along Route 40 to Eilat, make sure you visit at least one of the vineyards that have sprung up in recent years building on ancient irrigation techniques that already allowed the Romans 2,000 years ago to grow wine in the Negev. Eilat offers more of the classic seaside vacationing: diving in the Red Sea, swimming with dolphins, active nightlife in the city’s resorts. However, the culture and nature enthusiast finds more remnants of biblical times in Timna National Park and the marsh in the borderlands between Israel and Jordan offers bird watching. 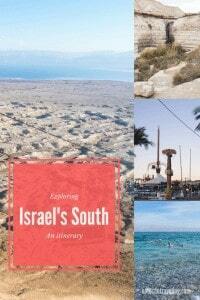 Click here for my comprehensive Eilat guide. In Eilat, turn back North onto Route 90. Within three hours, you’ll reach the Southern tip of the Dead Sea. Masada mountain is a must-see for any Israel visitor. 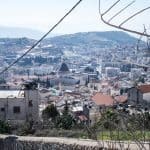 Best enjoyed bright and early for the sunrise, you can also do several day hikes around this mountain that was instrumental to the foundation of the myth of Israel. Click here for more about the Masada sunrise and how to plan a visit to the fortress. From Masada, it’s not far to the pleasures of the Dead Sea. You can float in the salty water and do mud masks (if you know where to go). Ein Gedi is another spring. Much bigger than the oasis Akev and Avdat, this one has views of the Dead Sea. Click here for more info on hiking in the Ein Gedi Nature Reserve. Click here to learn all about bathing and mud packing at the Dead Sea. This is the desert. 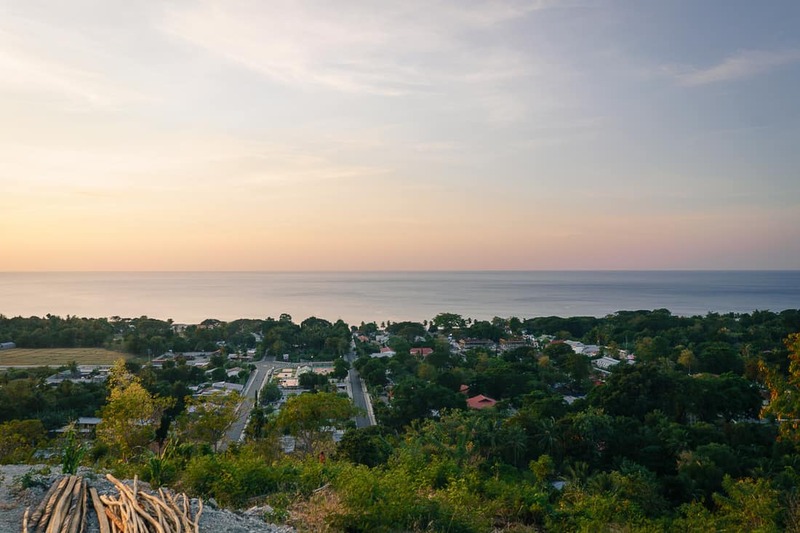 So make sure you are adequately equipped: Bring plenty of water (for your hikes: 1l/2h hiking), wear closed shoes with good grip, a hat, and sunscreen. 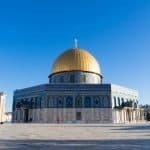 I’m thinking of going to Israel soon but I’ve never considered it before, so I’m just starting to look. Thanks for the detailed guide to seeing the desert. Awesome itinerary! I have a friend who goes to Israel a few times a year, I’ll share this with her! We have considered Israel, but don’t know when we would fit it in. 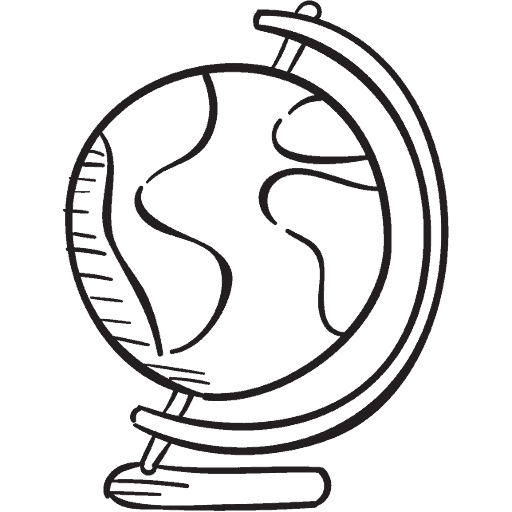 This article highlights a good itinerary, so it may just spark us to move the trip up our list. thanks. Great coverage, really appreciate the practical info and links you’ve provided! Sounds like a nice balmy trip for winter travels. 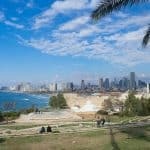 Great tips and Israel looks like a beautiful place. I have never been but this itiinerary shows me that I am missing out on some pretty cool stuff. And I don’t know why, but I would never have thought of Israel as the perfect winter getaway but it makes sense. 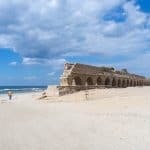 This is a great overview of visiting Israel – I have always been interested in visiting the sites from the bible. I’ve been wanting to go to Isreal for ages. I need to make it happen. Great pictures and itinerary. Thanks, Sonali! I think a week would be enough for the South – there is plenty more waiting to be discovered in the country! What an great itinerary! I have always wanted to visit Israel. I will definitely be looking back on this post. I would definitely like to try Route 40 since it has so many interesting sites along the way. Getting on a 4×4 from Sde Boker seems to be another wonderful idea. And I am definitely interested in knowing more of the history. I totally liked your itinerary in conclusion and will definitely take it when I visit here.